Do-it-yourself: Making a Chalkboard Wall! 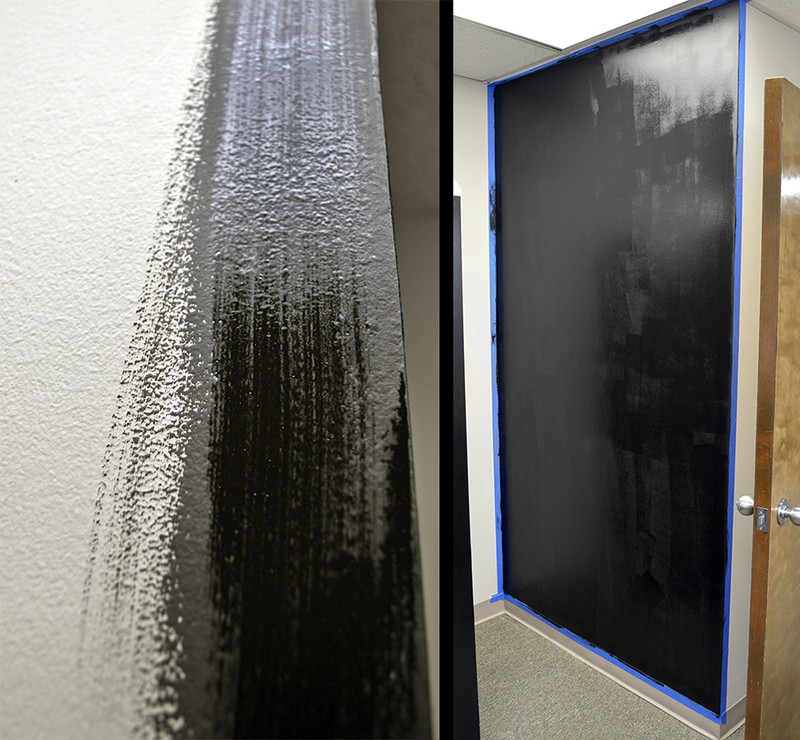 Recently at the Marker Supply office, we turned one of our walls into a chalkboard using Krylon’s Brush-on Chalkboard Paint. Take a look at the process and see how fun and easy this can be to do yourself! First, we taped off the edges of our wall to keep the paint in its place. Laying towels or garbage bags on the carpet below to catch drips is also a great idea! Have a window open or a fan blowing to help with ventilation. Make sure your surface is clean and smooth, and primed. Applying a primer to the surface to be painted will seal it, making the surface less porous and much better for becoming a chalkboard! Make sure your primer has dried for at least 4-6 hours before painting over. Then, using a roller or brush, apply the first coat of paint to the wall. Let it dry for a few minutes and then give it a second coat. Brush-on paint should be dry to the touch within 20-60 minutes, but may take 24 hours to dry completely. If you use spray-on paint for your project, the drying time will be shorter. At least 2 coats are needed to make an effective chalkboard. Some surfaces do the best with a 3rd coat of paint, to be applied after the 2nd coat is completely dry. 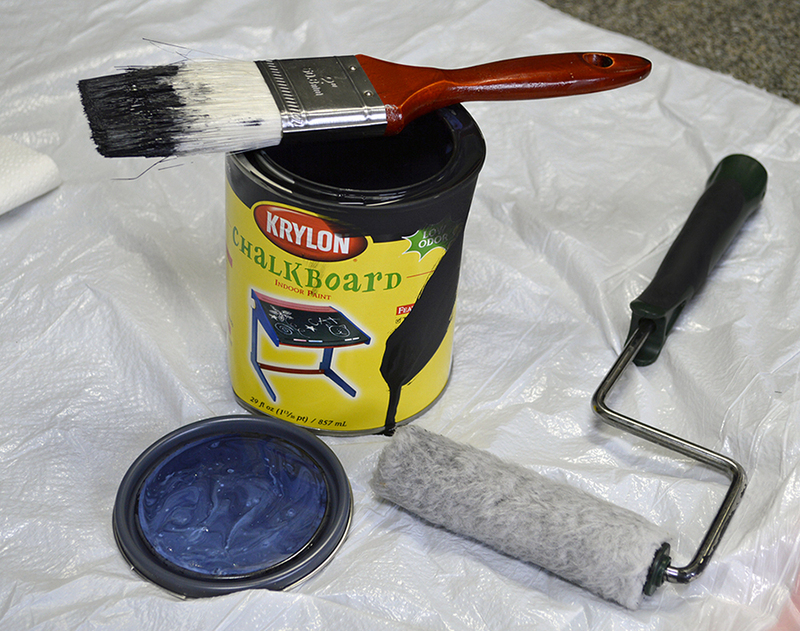 Krylon Chalkboard paint can be cleaned off of your hands and painting tools with warm, soapy water. When the painted wall is good and dry, time to “chalk it up”! Take a piece of chalk and color sideways with the broad edge over the surface of the board, and then smear the marks around. This is called “seasoning”, a process that will fill in any pores of the wall, sealing them and allowing the markers to be applied on and cleaned off more effectively. 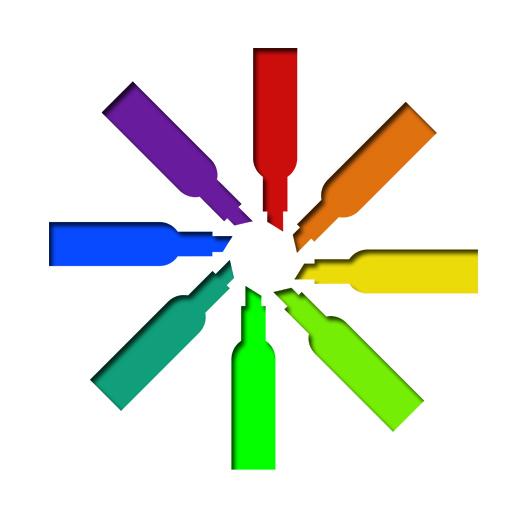 It will also help prevent “ghosting” of marker ink. Wipe the chalk off with a damp cloth and let dry. Now your new chalkboard surface is ready to use! Have fun! When you are ready to change your artwork, chalk and some markers can be removed using only a soft cloth & water, but other markers will need cleaner to get them off. Try our Scrubs do-it-ALL wipes, and use the Zig Chalkboard Cleaner Marker to remove dust and any stubborn leftover marks! *Be careful using certain markers, such as metallics, on painted chalkboards- the contents in the ink may cause the marks to “ghost” onto the wall and be hard to remove. A tip with using metallic chalk markers is to first apply a “base” with a white paint marker and the write over it with the metallic one. This will help keep the metallic ink from reacting as strongly to the chalkboard surface. When using a new marker, try it on a small test area first. If it stains, that spot will need another coat of chalkboard paint. *When cleaning your board, use DAMP cloths- avoid anything soaked with too much water or cleaner. Really wet cleaning methods can damage the painted surface. *After painting or cleaning, remember to let the board dry before marking with chalk or markers. The surface is softer when wet, which could cause the marks to soak in and become permanent. Doing a small craft like a mug? Follow a similar process with Pebeo Chalkboard Paint! 1. Make sure your surface is clean and smooth. If not painting the entire item, have your design thought out- using stencils can be a helpful way to make sure everything will fit and look the way you want. 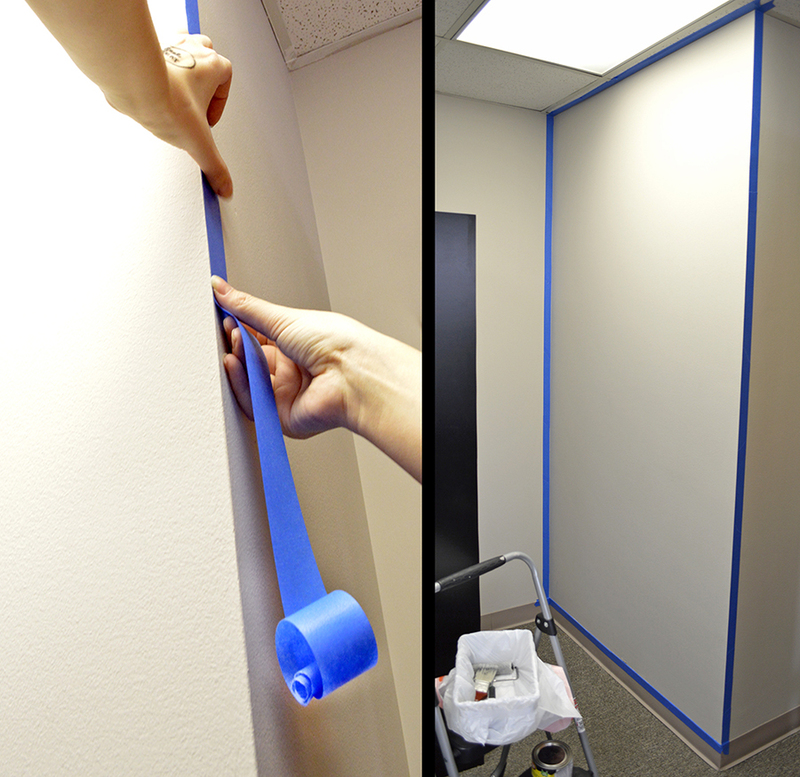 Stencils or painters tape will make it easy to apply the paint only where it needs to be! 2. Using a paint brush, foam brush, or mini roller- apply a coat of the paint. Let it dry a little and paint on another coat. 3. If doing a mug or other dishes that you intend to use and wash, let the item dry completely (about 24 hours) then bake the painted item at 350° for 35 minutes. This will make your chalkboard surface dishwasher and microwave safe! 4. If you’ve baked your dish, let cool completely. Take a piece of chalk and rub it all over the painted surface in order to seal the pores of the paint and make the chalkboard more effective to draw on and to clean. Wipe the chalk off with a damp cloth and then you are ready to go! Since chalkboards aren’t just for chalk anymore, check out some of our markers that work great on chalkboard surfaces! With the Krylon Chalkboard Paint for walls & signs, Pebeo Porcelaine Chalkboard Paint for smaller crafts, a variety of markers for use on chalkboard surfaces, and even special wipes to clean your boards, Marker Supply has all you need to enjoy doing a project like this yourself!